U.S. Games Systems, Inc. > U.S. Games Systems is Triple Winner at INATS! U.S. Games Systems is Triple Winner at INATS! It was terrific meeting many of our retailers at the International New Age Trade Show (INATS) held in Denver, Colorado June 26-28, 2015. 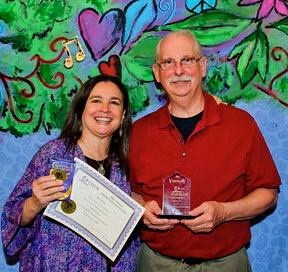 Every year at INATS the Coalition of Visionary Resources (COVR) honors the finest in the Mind Body Spirit market in the categories of books, music, jewelry, and products. This year U.S. Games Systems brought home three COVR Awards. (by Victoria Moseley) won for Best New Inspirational Deck. (by Chloe McCracken, with artwork by Will Worthington) won for Best New Oracle Deck. (by Toney Brooks, with artwork by Holly Sierra) received the award for Best New Tarot Deck. 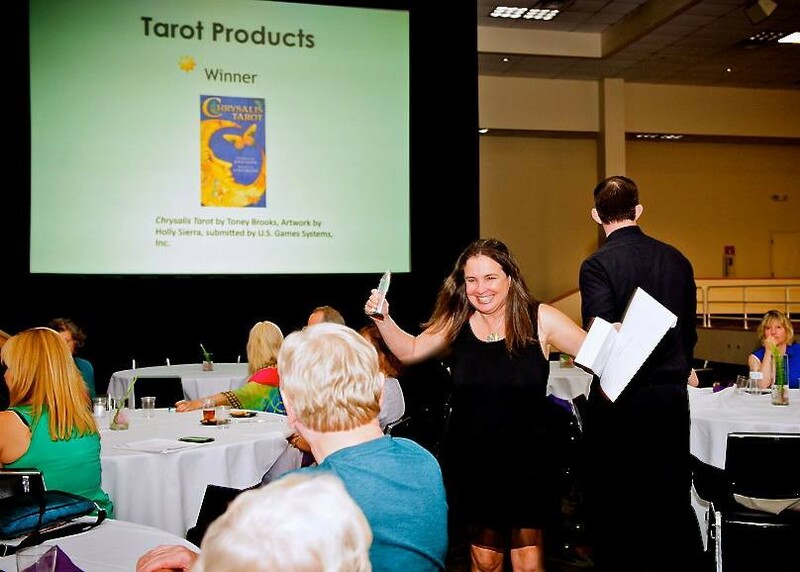 Holly Sierra joined the U.S. Games group at the COVR banquet to receive the award for Chrysalis Tarot. We all share her excitement! Chrysalis Tarot was also voted Tarosophy Tarot Association’s 2014 Deck of the Year. U.S. Games Systems is proud to showcase the talents of all our deck creators!